Many insects you might find out and about are cuddly, cute, and harmless for the most part. And because of this we usually ignore them until it gets to the point where they’re annoying us by buzzing around and around our heads or are just beginning to crawl a little too close to us. But normally, insects live beside us without having any issues. Some insects although, are just downright nightmarishly terrifying and can even be extremely dangerous if they are dealt with in the wrong way. These are the insects you will want to say far far away from at all costs. It’s definitely in your best interest. If you don’t, you may just end up paying the price. This is why everyone should be aware of insects like the ones we are getting ready to discuss. These insects can cause a very intense pain on their enemies and this pain can either last for hours or even up to days. It isn’t the type of pain that you’d want to take lightly. And if you are really having a bad day or unlucky, you might even come across one that delivers a sting or bite so bad that it can potentially result in far worse than just long-lasting pain. Some bites and stings from these insects can actually lead to death. Insects are typically small in size, but that does not mean they should be underestimated. Some of these bugs can be very dangerous. Just because they are small does not mean they can’t cause extreme pain and harm to even humans. We have compiled a list of 10 of the most terrifying insects in the world. If you ever come across one of these insects or find yourself in contact with one, it is best to always stray away and not take any chances. Just walk in the opposite direction and keep going. Give us your honest opinion and let us know which insect freaks you out the most! Read on if you dare. Out of all the insect stings there are, the world’s most painful belongs to none other than the bullet ant. It’s also known for being the world’s largest ant and possesses and very venomous and powerful sting that you don’t ever want to experience. Worker ants can be over 2.5 centimeters (1 in) long and look just like wingless wasps. We find this absolutely terrifying. The queen ant isn’t much bigger than the worker ant and is actually nearly the same size. Meaning every single one of them is pretty big. These terrifying creatures are much hairier than other related ants and have reddish-brown hair. 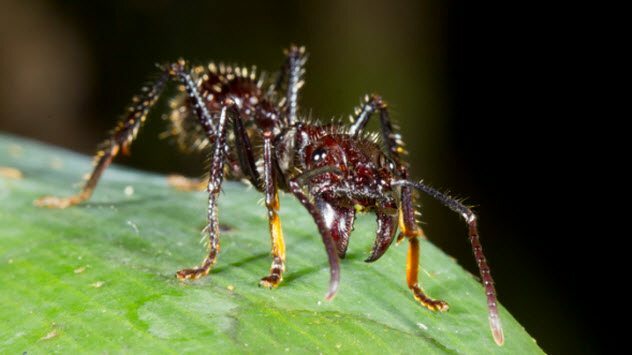 These kinds of ants can more than likely be found in South and Central America. If you live anywhere near these areas, pray you never run into a bullet ant. These ants get their name from the shot of intense pain that is delivered once someone is stung. The venom-filled sting has the ability to produce agonizing effects to whoever was stung for up to an entire 24 hours! The bullet ant is rated at a Level 4, which is the highest level of pain, according to the Schmidt Sting Pain Index. Which makes it rank higher than the paper wasp, harvester ant, and even the tarantula hawk wasp. Now that is pure power.